The following regarding Charles Strebel & Sons is extracted from American Families of German Ancestry, by Carl Schlegel (1918): "Charles (Karl) Strebel, second son of Georg Friedrich and Katherina (Saxer) Strebel, was born at the family home in the historic city of Worms, on the river Rhine, in the province of Rhein-Hessen, Germany, July 26, 1857. LIke his father, he received his educational training in the Volks-schule of his native city, and was confirmed in the Roman Catholic church at the age of fourteen. Soon after laying aside his schoolbooks he assisted his father in his work in his locksmith and machine shop, and under his guidance and tuition acquired a practical knowledge of the various details and techniques of the locksmith's and machinist's trade as it was then conducted in the Fatherland. Upon attaining to suitable years the young machinist became eligible and rendered military service in the German army, and upon his return home again he became actively engaged at his chosen work in his native city up to 1880, in which year he decided to emigrate to the United States. Having arranged his family interests and personal affairs, he embarked from the seaport city of Rotterdam, Holland, and set sail for the harbor of New York City. Immediately upon his arrival here, the young German mechanic became identified with his uncle, Edward Sarenze, who was at that time a builder and architectural iron worker in New York City, where he continued actively engaged for some time. Later, Mr. Strebel became identified with the Adam Happels [sic] Iron Works in New York City, and remained actively engaged there up to 1901. Being desirous of beginning business on his own account, Mr. Strebel enabled himself as a result of his industry and thrift to establish a plant at 398 Harman street, in the borough of Brooklyn, where he was successfully engaged in the manufacture of structural and architectural iron products for building and ornamental purposes... His business rapidly increased, and in order to meet the requirements of his trade he erected and established a new building at No. 2360 Myrtle avenue, in the Ridgewood district of the borough of Brooklyn, where the enterprise had been successfully carried forward by Mr. Strebel up to 1906. 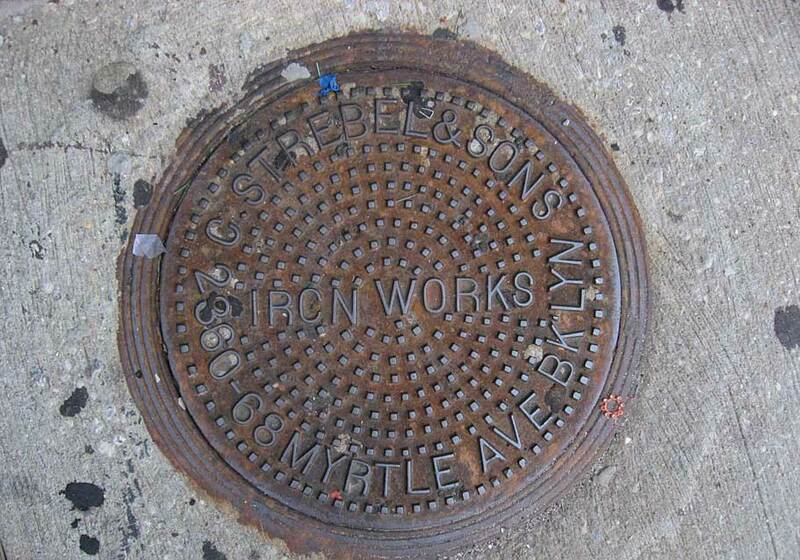 He later admitted two of his sons into partnership, and the firm name was changed to Charles Strebel & Sons Iron Works. The business has since been successfully carried forward under the direction and management of the father and sons, and at the present time (1917) the Charles Strebel & Sons Iron Works furnish employment for a large number of skilled mechanics and artisans who have their homes in the Ridgewood district, where the Charles Strebel & Sons Iron Works have contributed much to the material growth of the neighborhood wherein they are situated." Charles Strebel Iron Works are first listed in the Brooklyn telephone directory in 1902, when they were located at 398 Harman St., Brooklyn. The business name changed to Charles Strebel & Sons in 1908, and the address changed to 1732 Myrtle Ave. in 1910. The address changed again in 1915, when they moved to 2360 Myrtle Ave. This was their address until 1931, when they moved again; this time going to 60-10 Myrtle Ave., Ridgewood. They stayed at 60-10 Myrtle Ave. until 1957. The founder of Strebel Iron Works was Charles Strebel (1857-1916). His naturalization petition, 2 March 1888, stated that he was born in Germany and arrived in New York City 1 May 1881. He appeared in the 1900 U. S. Census, age 42, born July 1857, and living at 398 Harman St., Brooklyn. His occupation was recorded as "Railing Maker," and he lived with his wife, Barbara, age 43, born Germany. The couple had been married 19 years, which means they were married 1881, the year of Strebel's immigration. In 1900 they had five children ranging in ages from 18 to 7. Strebel's passport application, dated 3 Nov. 1908, stated that he was born 26 July 1857 in Worms, Rhein-Hessen, Germany, and that he emigrated on the SS Schiedam from Rotterdam, Nederland, 2 May 1881. This ad from the Brooklyn Daily Eagle dates from 1909 when C. Strebel & Sons were located at 1732-1736 Myrtle Ave., Brooklyn. This ad from the Brooklyn Daily Eagle Almanac dates from 1912 when Charles Strebel & Sons were located at 1732-1734 Myrtle Ave., Brooklyn. This ad from the Year Book of the New York Society of Architects dates from 1916 when the business was located at 2360 Myrtle Ave.
Queens Borough, New York City, 1910-1920 published by the Chamber of Commerce of the Borough of Queens (1920) included "Chas. Strebel & Son, Ridgewood, Structural steel and iron" in its list of Queens factories. Strebel employed 25 employees as of April 1920, and was listed as being established in Queens in 1908. Henry F. Strebel (1884-1957?) was a member of the Chamber of Commerce as of 4 Jan. 1918. Henry Strebel was one of Charles Strebel's sons who succeeded him in the business. A later address for Charles Strebel & Sons is inscribed on this heavily painted knob on a sidewalk opening. An identical knob is found on Roosevelt Ave. near 58th St., Queens. Strebel were located at 60-10 Myrtle Ave. approximately 1931 to 1957.